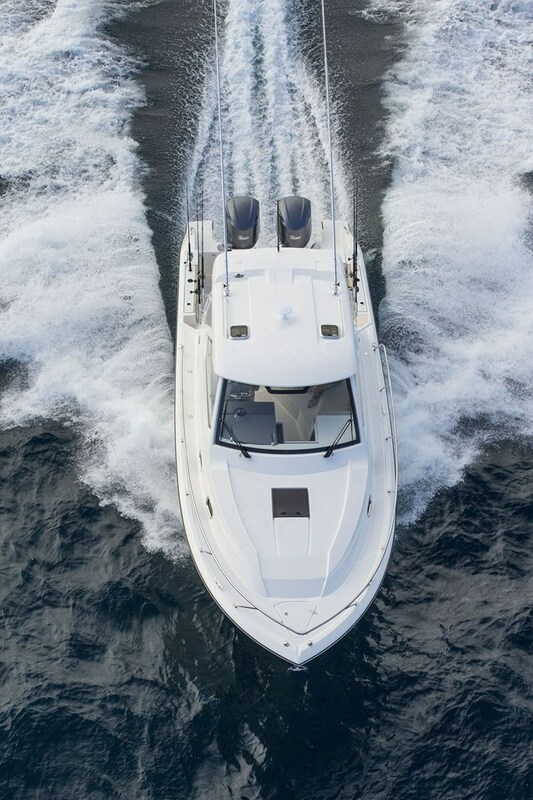 Pursuit Boats of Fort Pierce, Florida, part of the Tiara Yacht family of Holland, Michigan, introduced five new models for 2015/16 including this OS 325 Offshore, the smallest of three models of cabin boats ranging from this thirty-four footer up to the triple outboard powered OS 385 at thirty-nine feet. 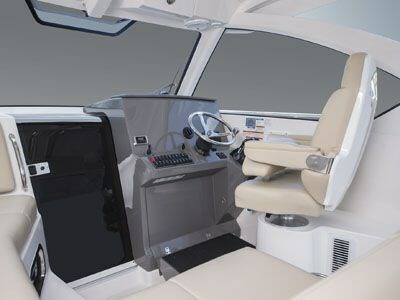 In all, for 2016, Pursuit offers fourteen models of Center Console, Dual Console, Sport Tender Center Consoles, plus one Sport Coupe ranging from twenty-three to forty-three feet. Consistent with all Pursuit models, the OS 325 is loaded with an abnormally large complement of standard equipment. The entire deck and self-bailing cockpit liner is one single molded piece for added strength and rigidity. The adjustable, swivel helm chair with fold-up armrests plus swing down helm-mounted footrest is opposite a molded passenger L-shaped lounge with storage and molded footrest. All cockpit upholstery utilizes dri-fast foam and mesh backing. 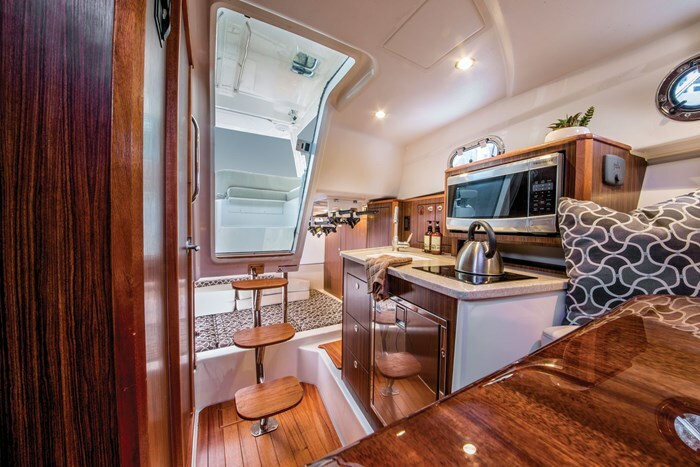 A folding three-wide stern seat with patented adjusting backrest faces a single molded aft-facing seat next to the standard entertainment center with sink, hot and cold faucet plus storage and cutting board. The cockpit also features an entertainment system with AM/FM Bluetooth® compatible stereo with amp, seven speakers plus dash remote. 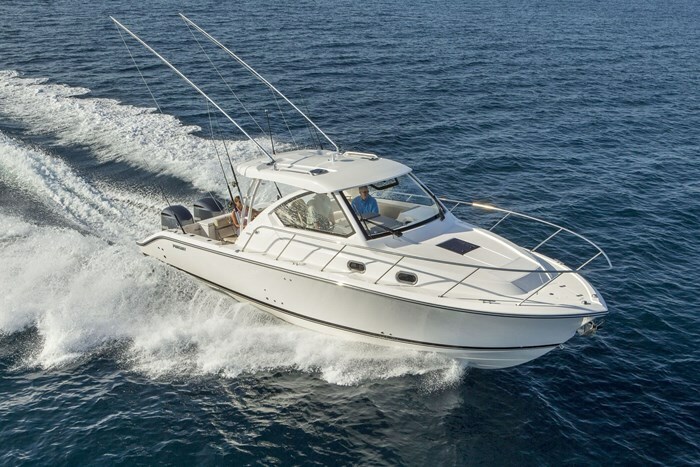 Also included are fresh and raw water washdown, tackle center, two insulated fish boxes, 24-gallon recirculating livewell, molded-in side cockpit access stairs, under gunwale rod storage plus four in-gunwale stainless steel rod holders. Pop-up cleats are standard. The custom, optically clear, one-piece extra high windshield with a powered opening center vent, dual pantograph wipers with washers and custom resin impregnated fibreglass frame is fully integrated with the standard molded hardtop equipped with integrated visor, four tri-colour LED overhead lights, aft-facing spreader light, topside and underside grabrails, 60 mil stratoglass side curtains, two overhead screened hatches, plus overhead glovebox and life jacket storage. 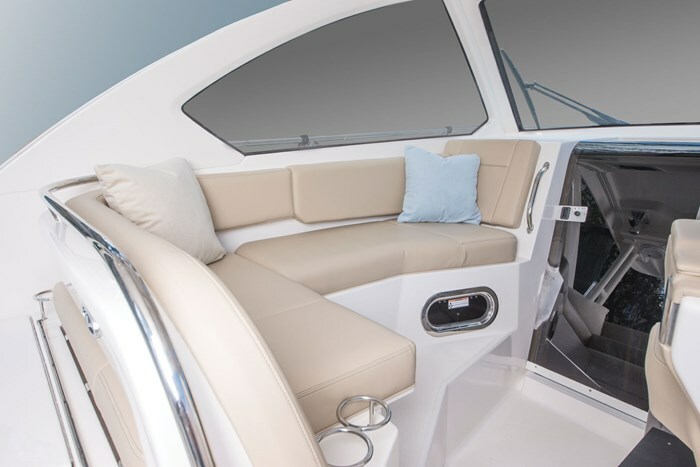 Three solid wood stair-steps lead down from the molded, tinted acrylic door to the single molded interior hull and deck liners of the OS 325’s cabin complete with built-in sound insulation plus custom wood floor accents. The wide 10-foot, 10-inch beam offers lots of elbow and headroom below. 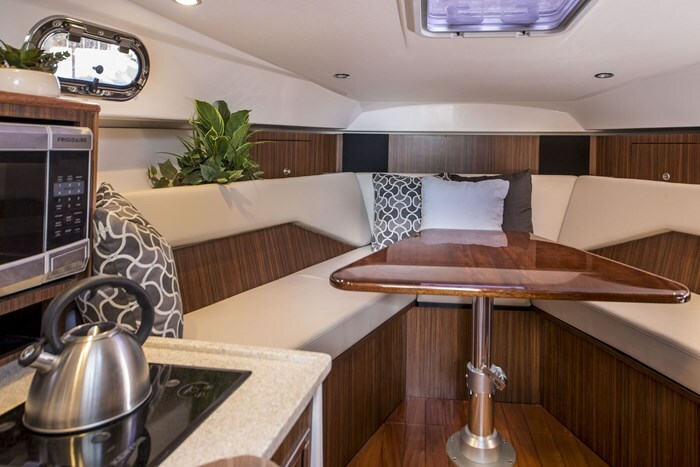 A gas-assisted hi-lo polished solid wood V-berth dinette table converts to a bed while a full size mid-cabin berth is fitted with a 3-inch foam mattress plus quilted cover. This mid-cabin features a lit hanging locker, overhead LED lighting, floor accent light, screened opening portlight, plus overhead rod storage. The portside galley is standard equipped with Corian® counter top, molded sink with hot and cold water and cutting board cover, stainless steel refrigerator and microwave, single glass top burner with touch controls and pop-up pot holders, upper and lower cabinetry and drawers, AC and DC power outlets plus a dual USB charger. A Pursuit digital media ready entertainment center with 19” TV is also standard. A custom 1 ¼ “ solid wood framed entrance door opens to the starboard, molded enclosed head compartment with designer sink, Corian® countertop, pull-out shower wand, vanity mirror and storage plus overhead storage with dual mirrors and a standard vacuum flush marine head with a fold-down fibreglass seat cover. Additional notable standard equipment on the OS 325 includes an integrally molded, thru-stem anchor system with roller and both raw and fresh water washdown plus electric anchor windlass complete with stainless steel plow anchor with 200 feet of chain. Also standard is a bow thruster with its own battery, auto-retract trim tabs with indicators, and integrated port and starboard transom platform extensions complete with a four step telescopic boarding ladder. Also standard are dockside power with isolation transformer, five batteries, a 40-amp charger for house, electronics, and thruster plus a 20-amp charger for the engine cranking batteries, hot water tank, hot and cold cockpit shower, plus dockside water inlet. 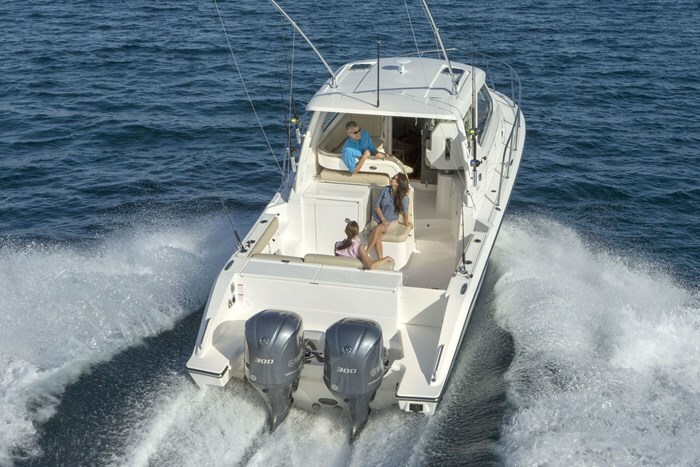 Standard outboard power for the OS 325 is a pair of Yamaha® 300 horsepower 4-strokes providing a 30 mph cruising speed at 4000 RPM and a top speed of 48 mph. Range at cruising speed is approximately 340 miles. Notable optional equipment includes a choice of four hull side colours with several choices of boot stripe colours, several (white) Stamoid® or Sunbrella® canvas covering options, cockpit retractable electric sunshade, Yamaha Helm Master® joystick steering control system, remote spotlight, underwater lights, cockpit table, foredeck sunpad, outriggers, 4.2 Kw Panda diesel generator, reverse cycle cabin air conditioning/heating, cockpit refrigerator/freezer, and a cockpit entertainment package which includes cockpit air conditioning/heating plus a Kenyon electric grill.